Performance presented as part of 9 Evenings: Theatre and Engineering, The 69th Regiment Armory, New York, N.Y., United States, October 15-21, 1966. Yvonne Rainer, Carriage Discreteness, 1966. Dancers await their choreographic instructions via walkie-talkie from Yvonne Rainer (Robert Morris in the second performance). Performance presented as part of 9 Evenings: Theatre and Engineering festival, The 69th Regiment Armory, New York, N.Y., United States, October 15-21, 1966. In Carriage Discreteness, Yvonne Rainer guided both dancers and non-dancers through a series of generic tasks, such as walking and carrying stage props from one point to another. At the same time, various technological components were used to operate projectors, lights and other objects that were capable of generating movement. While this sequence was programmed, there was also some choreographic improvisation, derived from decisions that Rainer made on the spot. In both cases, events followed one another in linear fashion: the technological components triggered various mechanisms a step at a time, and the dancers completed only one task at a time. The only possible crossing point between distinct elements lay in the overlapping of these sequences (1). 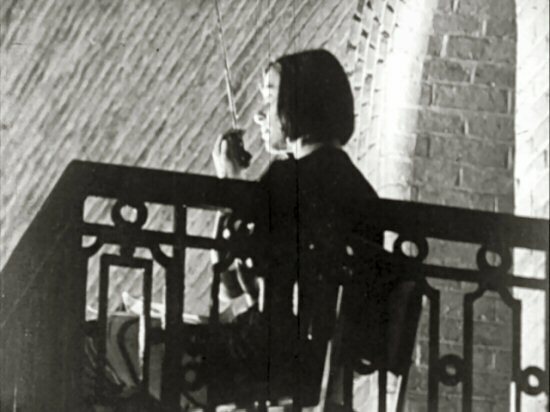 Rainer remained on the Armory balcony throughout the performance, relaying her instructions by walkie-talkie (Robert Morris played this role on October 21). The dancers, for their part, were equipped with receivers that they wore on either their wrists or shoulders (a), (b). At the start of the performance, an array of objects (including plywood panels, metal sheets, pipes and parallelepipeds made by the sculptor Carl André) (c) were placed into 20 separate sections of a grid that had been drawn with chalk on the Armory floor. Alone or in pairs, the dancers carried objects designated by the choreographer from one zone to another (d), (e), (f), (g), (h), (i), (j), (k), (l), (m). Before being called upon, the dancers stood and waited for instructions (n), (o), (p). As the performance started, all of the objects were grouped in accordance with shared characteristics such as their dimensions and materials and, at times, their functions (q). Rainer had also ensured that the large objects weighed less than the small ones. As the dancers continued to move these elements around, the initial taxonomic system gradually gave way to disorder (2). Echoing this first choreographic series, the second series of events unfolded in accordance with a program designed to trigger (in a 67-step sequence) the mechanisms of various mechanical devices (3). On several occasions, slides were projected on two screens that served as stage backdrops. The slide trays contained 10 images of, among other things, a series of advertising posters for dance pieces that Rainer had created with the Judson Group Theater since the mid-1960s. Several 16-mm projectors switched on intermittently to show excerpts from films, the exact titles of which Rainer did not identify in the sequence. The first excerpt showed the actor W.C. Fields juggling cigar boxes (r), (s), while the second presented a close-up of the face of the actor Jimmy Cagney (t). Prominent among the programmed events were the movements of certain objects, like the transparent ball and solenoid that moved on wires stretching across the entire breath of the stage, the 100 Styrofoam balls that fell to the floor from a cage 50 feet above, the screens on which the films and slides were projected but that eventually sagged and fell down (u), (v), (w), (x). In addition, lighting instructions played a role in this series. The stage was uniformly lit most of the time, but occasionally one of the dancers blew into a hunting horn as a signal to a technician to redirect the lights from the auditorium to the stage. A powerful floodlight rented on Broadway switched on briefly and lit up the ceiling. The two series of events (the movements of the dancers and objects) overlapped when Steve Paxton launched himself from the balcony on a swing 50 feet above the floor (y), (z). This brought the performance to an end. The two performances lasted approximately 45 minutes each (4). To round off these notes, the table appended here places the second sequence side by side with the transcription of an audio recording of the instructions spoken by Robert Morris on October 21 (first sequence) (5). (1) Paragraph based on Yvonne Rainer’s statement about her performance in the program. See: 9 Evenings: Theatre and Engineering, Pontus Hultén and Frank Königsberg eds. ([New York]: Experiments in Art and Technology: The Foundation for Contemporary Performance Arts, ). (2) Yvonne Rainer, in an interview with Clarisse Bardiot, August 2005, N.Y.
(3) The first version of this program (comprising 68 steps) was first described by Rainer in a document that was included in the manuscript of an unpublished book by Harriet DeLong on 9 Evenings. See: Manuscript, 1966 (1972-1973): I Artists: G. Yvonne Rainer, “Carriage Discreteness” / Harriet Delong; Simone Forti Whitman; Billy Klüver. Experiments in Art and Technology. Records, 1966-1993, Research Library, The Getty Research Institute, Los Angeles, California (940003), Box 1, file 10. The definitive version of this description can be found, along with other texts by Rainer, in an anthology published in 1974. See: Yvonne Rainer‚ Work 1961-73‚ Halifax, Press of the Nova Scotia College of Art and Design, 1974. p.304. (4) Length extrapolated from that of the audio tape recordings (33 minutes) in the collection of the Sohm Archiv (Stuttgart, Germany). At the time 9 Evenings was performed, Yvonne Rainer was considered to be one of the most promising choreographers of the Judson Dance Theater, which she found. After spending her childhood and adolescence in San Francisco, Yvonne Rainer moved to New York in 1956. After completing his military service in Denmark, Per Biorn studied electrical engineering, then emigrated to the United States in 1962.